Fifty years ago today, everything was as groovy as it had been 20 days earlier. It was a Saturday, so 13-year-old Valerie S. of South Pasadena was able to join her mother on a gift-buying excursion for her older sister, whose birthday was the following day – but not before sleeping until about 10am. She also “watched” her hair. 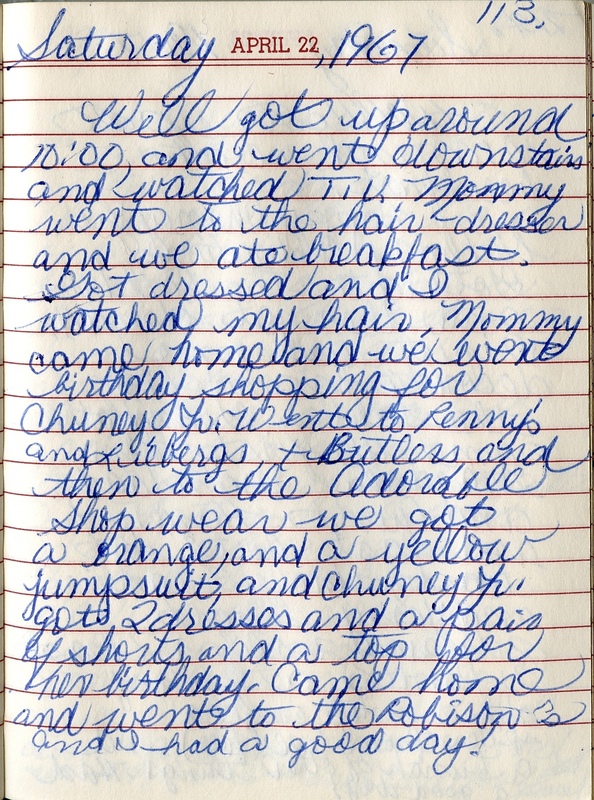 As she says at the end of her diary entry, she had a good day. Sixteen-year-old Wendy D. of suburban Pittsburgh also went shopping with her mom this day – but for herself. 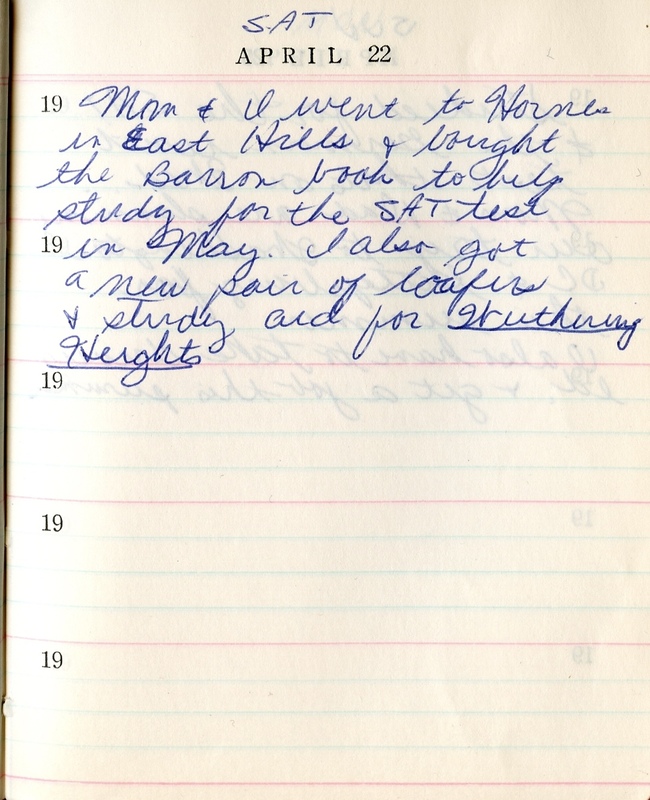 She picked the Barron’s SAT book to prepare for the exam, which was scheduled for the following month, plus a study guide for Wuthering Heights. But the day wasn’t a total scholastic-related enterprise. She also bought a pair of loafers. It may seem like a hum-drum life, and it was for her just now – but that would change in the coming months. I share their experiences for a reason: Yesteryear was not as different from today as we sometimes make it out to be. The 1960s are oft-romanticized because of the music, drugs, free love, social movements and Vietnam War, and assassinations, but – just as today – the reality that most people experienced wasn’t anywhere near as dramatic as what is portrayed in the movies or TV, or even in the news accounts of the day. Discrimination and prejudice were much more pronounced, no question, but – regardless – most men and many women went to work every weekday morning, and worried about the mortgage, bills and kids. And life unfolded for most teens much as it does, still: They slept late on weekends, went shopping with parents, worried about and studied for school, and hung out with friends. Most didn’t run away from home or descend upon Haight-Asbury (though they may have worn flowers in their hair). 1) Frank & Nancy Sinatra – “Something Stupid.” For the second week in a row, this fun father-daughter duet held the top spot. 2) The Monkees – “A Little Bit Me, A Little Bit You.” Jumping from No. 5 to No. 3 in its fifth week on the charts is this Neil Diamond-penned pop song. 3) Tommy James & the Shondells – “I Think We’re Alone Now.” In its 11th week on the charts, this classic single climbed from No. 7 to No. 4. 4) The Supremes – “The Happening.” The title song to the flop movie of the same name is this fun little number, which clocked in at No. 11. It was the last single released prior to the group being renamed Diana Ross & the Supremes; and the last Supremes single with Florence Ballard. 5) The Platters – “With This Ring.” If you listened to the Wolfman Jack air check above, you already heard this single, which peaked this week at No. 14. It sounds like was airlifted in from 1959. (Side note: A movie could and should be made of this group due to its ever-churning lineup. 6) The Easybeats – “Friday on My Mind.” Jumping from No. 46 to. No. 30 this week is this classic ode to the weekend that was written by band members Harry Vanda and George Young. Here’s a piece of trivia: Young is the older brother of AC/DC’s Malcolm and Angus Young, and co-produced (with Vanda) many of their early albums. 7) The Young Rascals – “Groovin’.” New to the charts, at No. 79, is this signature song from the Rascals, which would hit No. 1 on May 20th.